My Knitty SP really knows what I enjoy! 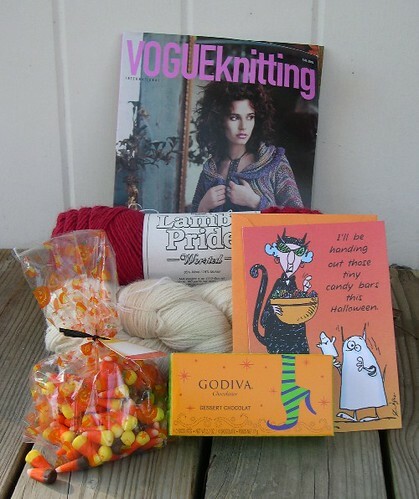 A package arrived from her yesterday, and it contained some of my favorite things: Lamb's Pride worsted weight in a gorgeous red, some natural colored alpaca yarn, Godiva chocolates, a copy of Vogue Knitting magazine that has some lovely shawls in it, and a bag of candy corn and candy pumpkins. Thank you, SP! Oh, see that card? It is truly LOL funny. Trust me on this. I LOLed when I read it. The front says "I'll be handing out those tiny candy bars this Halloween." and you open it up to read "I think they are called bite me-sized." See. I told you it was funny! Here's a photo of my goodies. 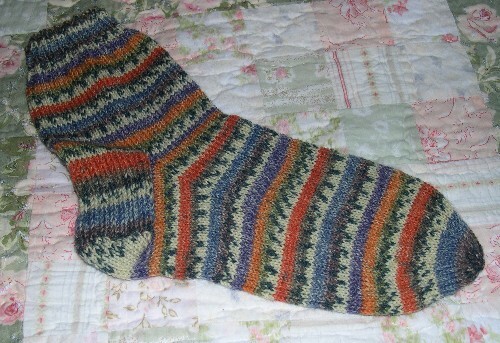 Here's the first of my pair of Opal socks. I used a six point star toe on this sock. It was really easy, and I like not having the "seam" down the sides of the toe. I'm about 2/3 into the cuff of the second sock, so it should not take much longer to finish it. The weather is cool, so it's time for new socks! I love the socks! They look like a lot of work went into them. They are so cute. I wouldn't have the patience to create them...I'd end up going to Walmart and getting the same brand that my feet easily wear holes into. What nice goodies! The yarn from your family spin-in is gorgeous.